Combine (a) an album by David Bowie with (b) a single by the Pet Shop Boys and you may find yourself Outside Suburbia. Equally, and more pertinent to this review on 29th Feb, you might leap to the phrase Low Rent. 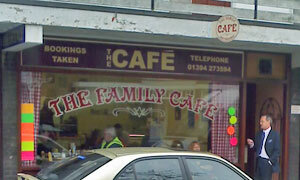 Welcome to the Family Cafe, where bookings are taken. I'd usually refer you to the map but the FC appears to have disappeared, maybe 'cos I was chiding BoytonBoy that there's no such venue. We'd intended to drop in at the Ordnance Fish Bar and were parking up outside a row of shops when, voila, I spied a cafe sign. Would take no more than a lick of paint to fix that final "E' to an "F". Medium for me and Grenvyle, including mug of tea plus bread & butter, all for £4.90: pretty good value. Kev's scrambled eggs turned up before our meal deals which took a reassuringly long-ish time to come. Took full advantage of the HP and Heinz table sauces, both with Stay Clean tops, note. Popular place with the van driving hi-vis brigade, and those boys can scent value a mile off. There may even have been the odd newspaper floating around too. And 20 points for a rare sighting of those green and yellow and orange and pink fluorescent stars, saying things like "tea and two crumpets, £1.20" in scrawly writing. If it was a car -- Mazda 626. If they were passing by -- Phil Daniels.